A recent report published by Infinium Global Research on end cartoning machine market provides in-depth analysis of segments and sub-segments in the global as well as regional end cartoning machine market. The study also highlights the impact of drivers, restraints, and macro indicators on the global and regional end cartoning machine market over the short term as well as long term. The report is a comprehensive presentation of trends, forecast and dollar values of global end cartoning machine market. According to the report, the global end cartoning machine market is projected to grow at a CAGR of 6.21% over the forecast period of 2018-2024. End cartoning machine is a packaging machine that is used to form cartons or container. A cartoning machine forms cartons in different manners such as straight. Those in the closed format are folded, side-seamed, and ultimately sealed. Cartoning machine can be divided into two types such as horizontal cartoning machines and Vertical cartoning machines depending on the position of the carton that is fed through the machine. On vertical cartoning machine product is inserted manually or automatically and carton is fed through the machine in a vertical position. While on horizontal cartoning machines, products are inserted from the side of the carton. Vertical cartoning machine used for packaging bare products and these products must be supplied by gravity. Horizontal cartoning machine commonly used in the packaging of food products. Rising use of e-commerce and huge demand for cartoning machines by logistics drives the growth of end cartoning machine market. Moreover, increasing demand from pharmaceuticals and food and beverages industries and huge presence of food and beverage manufactures in different regions boosts the growth of end cartoning machine market. Rising demand for brand differentiation among organizations propels the growth of end cartoning machine market. Now a days, manufactures are adopting new technologies for packaging products this in turn increases the demand for cartoning machine that fuels the growth of end cartoning machine market. Furthermore, growth in automation industry drives the growth of end cartoning machine market. However, absence of standardization and other advance packaging machines hampers the growth of end cartoning machine market. Innovation in technologies such as integrated barcode systems and vision system are expected to provide beneficial opportunities for end cartoning machine market. Among the geographies, Asia-Pacific dominates the end cartoning machine market owing to wide industrialization and huge presence of food & beverage product manufacturers in the region. Rising demand of cartoning machine by the logistics in the region boosts the growth of end cartoning machine market. In Europe, end cartoning machine market is expected to grow owing to rising e-commerce and increasing demand for end cartoning machine in the region. The report on global end cartoning machine market covers segments such as product type, orientation, dimensions, and end user. On the basis of product type, the sub-markets include less than 70 cpm, 70 cpm to 150 cpm, 150 cpm to 400 cpm, and more than 400 cpm. On the basis of orientation, the sub-markets include vertical, and horizontal. On the basis of dimensions, the sub-markets include less than 200 cc, 200 cc to 1,000 cc, 1,000 cc to 5,000 cc, 5,000 cc to 10,000 cc, and more than 10,000 cc . On the basis of end user, the sub-markets include food & beverage, healthcare, personal care, and others. The report provides regional analysis covering geographies such as North America, Europe, Asia-Pacific, and Rest of the World. In this section, the key trends and market size for each geography are provided over the period of 2016-2024. The countries covered in the North America region include the U.S., Canada, and Mexico; while Asia-Pacific includes China, Japan, India, South Korea, Malaysia, and among others. Moreover, Germany, U.K., France, Spain, and Rest of Europe are included in the European region. The U.S. drives the growth in the North America region, as it is the largest market in this region. The Asia-pacific region offers substantial potential for the market growth owing to rapid growth in markets such as India and China. The report provides profiles of the companies in the market such as IWK Verpackungstechnik GmbH, ROVEMA GmbH, Robert Bosch Packaging Technology GmbH, Mpac Group plc., Omori Machinery Co., Ltd., Douglas Machine Inc., SHIBUYA Packaging System Corporation, Marchesini Group S.p.A., ACG Worldwide Private Limited, and EconoCorp Inc. The report provides deep insights into the demand forecasts, market trends, and micro and macro indicators. In addition, this report provides insights into the factors that are driving and restraining the growth in this market. Moreover, The IGR-Growth Matrix analysis given in the report brings an insight into the investment areas that existing or new market players can consider. 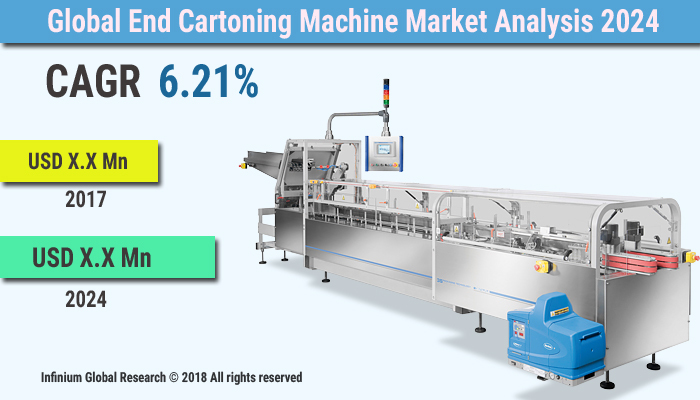 The report provides insights into the market using analytical tools such as Porter's five forces analysis and DRO analysis of end cartoning machine market. Moreover, the study highlights current market trends and provides forecast from 2018-2024. We also have highlighted future trends in the market that will affect the demand during the forecast period. Moreover, the competitive analysis given in each regional market brings an insight into the market share of the leading players.